This is just in direct from the "SCORPIONS" Coffee Mess. 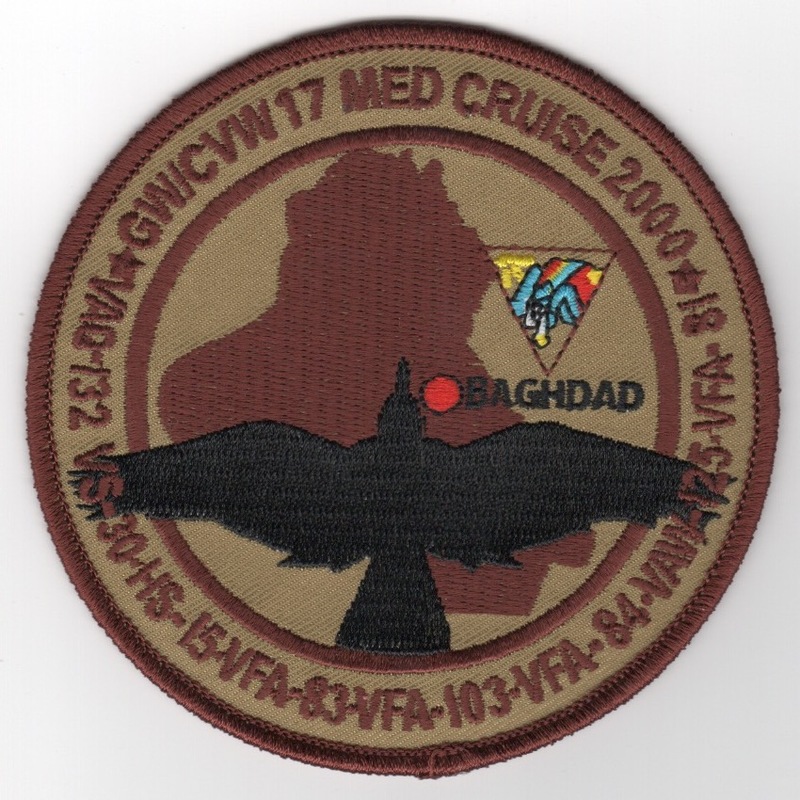 This is the 'red-white' version of the 50th Anniversary bullet patch created for VAQ-132. It says "SINCE 1968" (bottom) and "50 YEARS" (middle). This patch does not come with velcro attached. 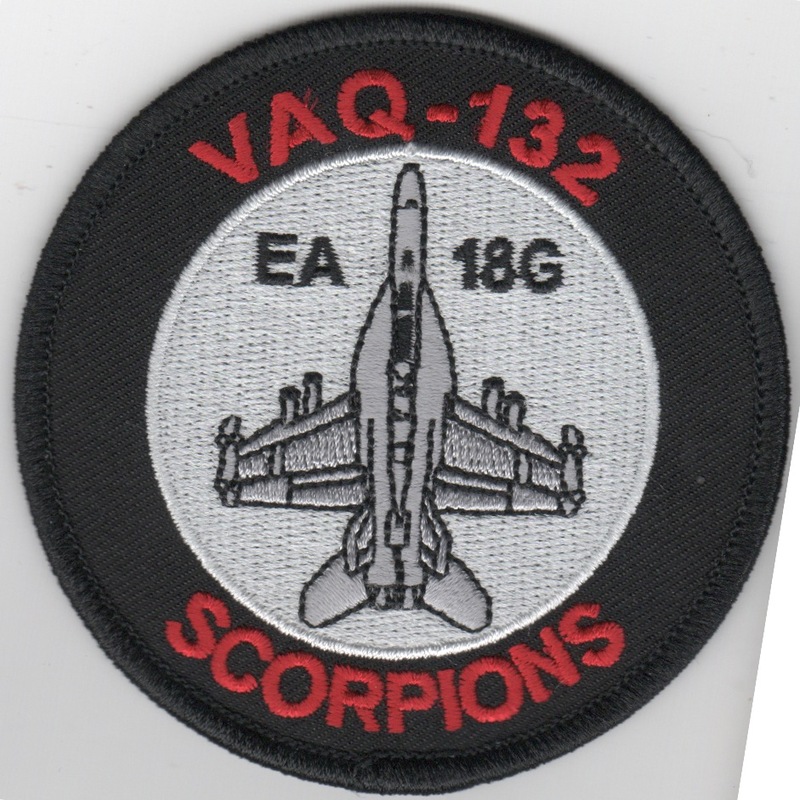 This is the white version of the current squadron patch for the VAQ-132 'Scorpions' that fly the E/A-18G "GROWLER" out of NAS Whidbey Island, WA. 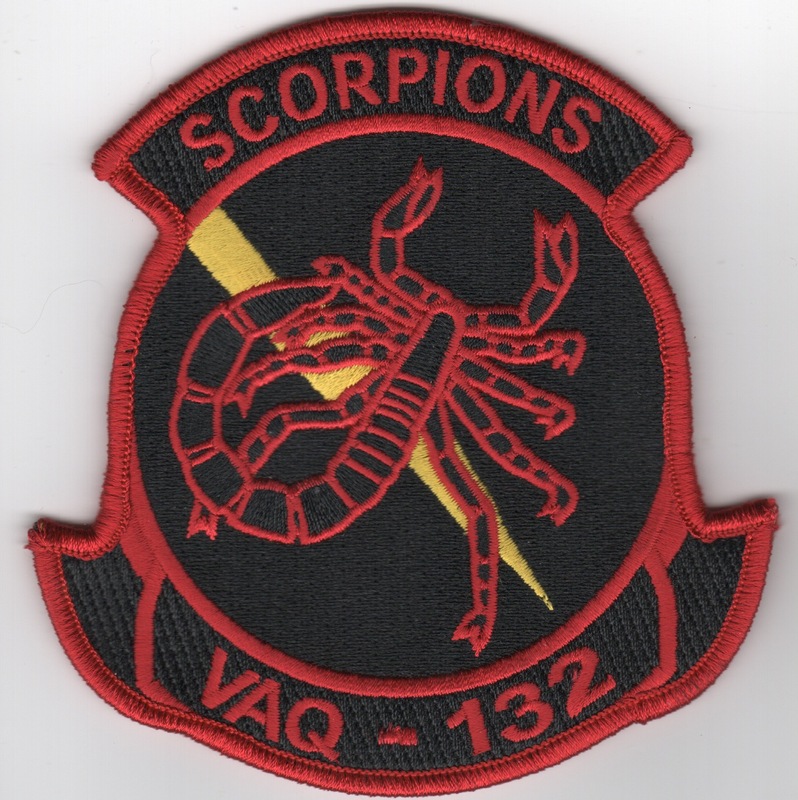 This is the red/black version of the current squadron patch for the VAQ-132 'Scorpions' that fly the E/A-18G "GROWLER" out of NAS Whidbey Island, WA. 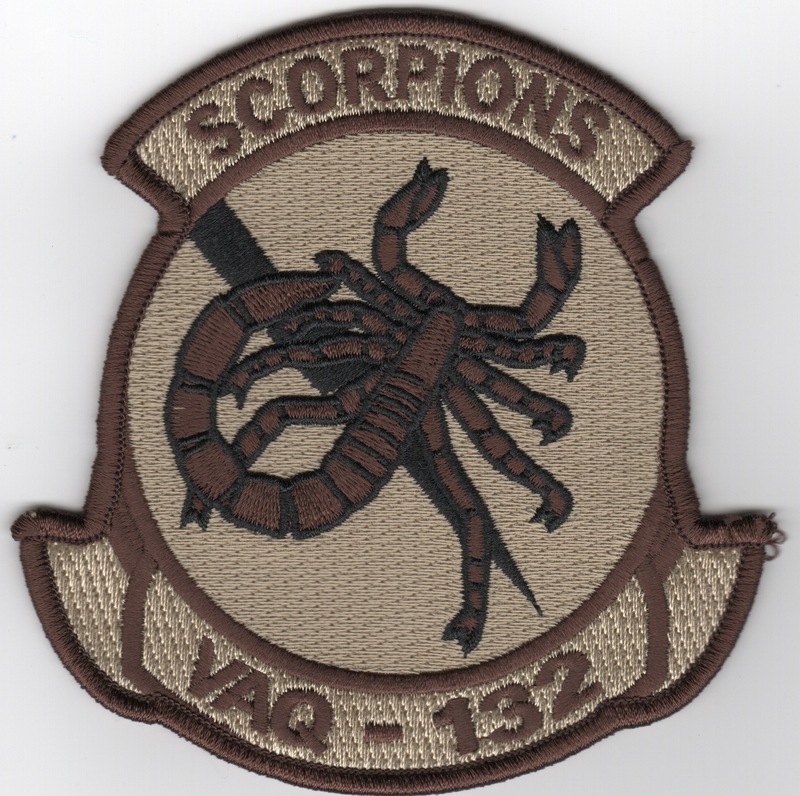 This is the desert version of the current squadron patch for the VAQ-132 'Scorpions' that fly the E/A-18G "GROWLER" out of NAS Whidbey Island, WA. 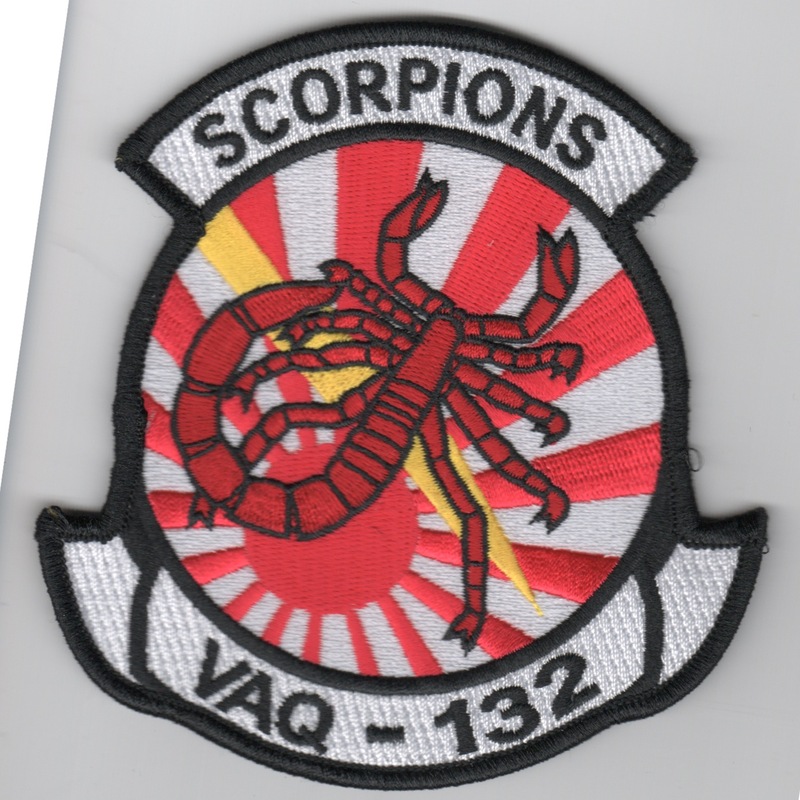 This is the 'setting sun' version of the current squadron patch for the VAQ-132 'Scorpions' that fly the E/A-18G "GROWLER" out of NAS Whidbey Island, WA. 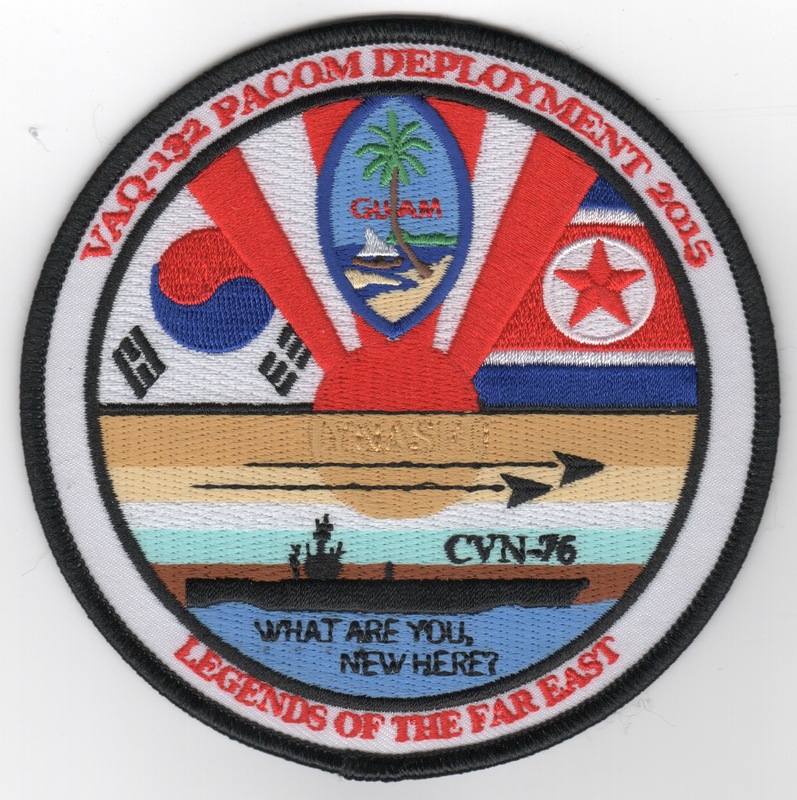 This is the 2015 PACOM (Pacific Command) cruise that says "WHAT ARE YOU, NEW HERE?" along the bottom and "LEGENDS OF THE FAR EAST" along the bottom edge. This patch DOES NOT have the subliminal message on it, see the one below for a "variation" of it. This patch does not come with velcro already attached. This is the 2015 PACOM (Pacific Command) cruise that says "WHAT ARE YOU, NEW HERE?" along the bottom and "LEGENDS OF THE FAR EAST" along the bottom edge. 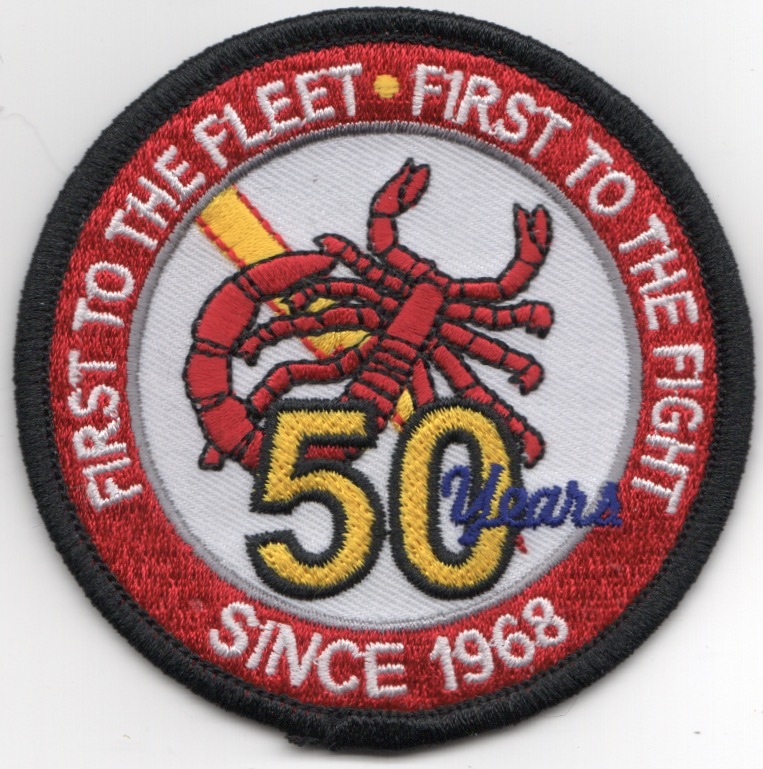 This patch DOES have the subliminal message on it....INYASFU is lettered in the "setting sun". Hard to see, but it's there. Now, what does it stand for? They won't tell me (yet).....This patch does not come with velcro already attached. This is the medium-sized version of the 2014 PACOM (Pacific Command) cruise that says "DEPLOYMENT IS HELL...IS THAT RIGHT?". 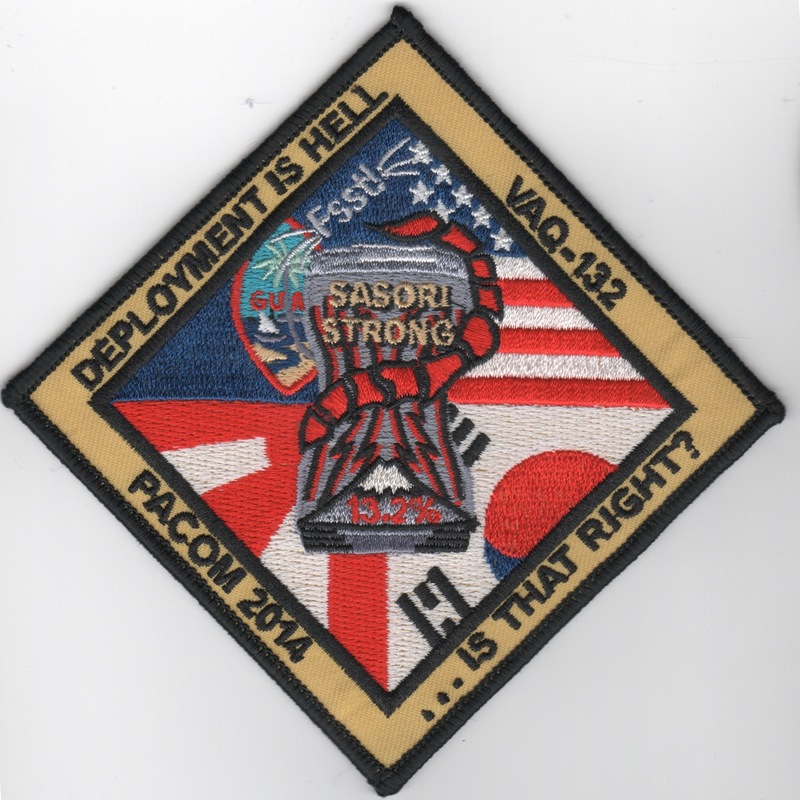 In the middle of the patch is a beercan with the Scorpion tail around it and says "SASORI STRONG" and 13.2%. It has the US, Japanese, S. Korean and GUAM flags on it. 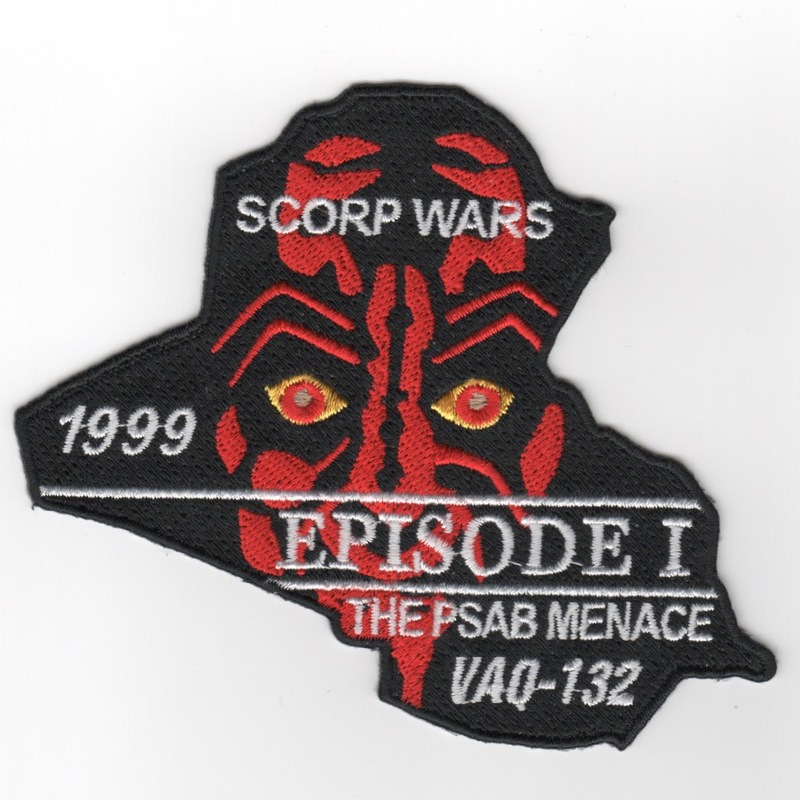 This is the 1999 "SCORP WARS" cruise patch created for VAQ-132 for their Operation SOUTHERN WATCH deployment to PSAB. It is in the shape of the country of Iraq, has Darth Maul (Star Wars, Episode I) and says "THE PSAB MENACE" along the bottom. This patch does not come with velcro attached. 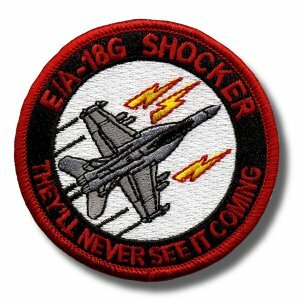 This is the black version of the aircraft "coffin" patch for the VAQ-132 'Scorpions' that fly the EA-18 'GROWLER' out of NAS Whidbey Island, WA. 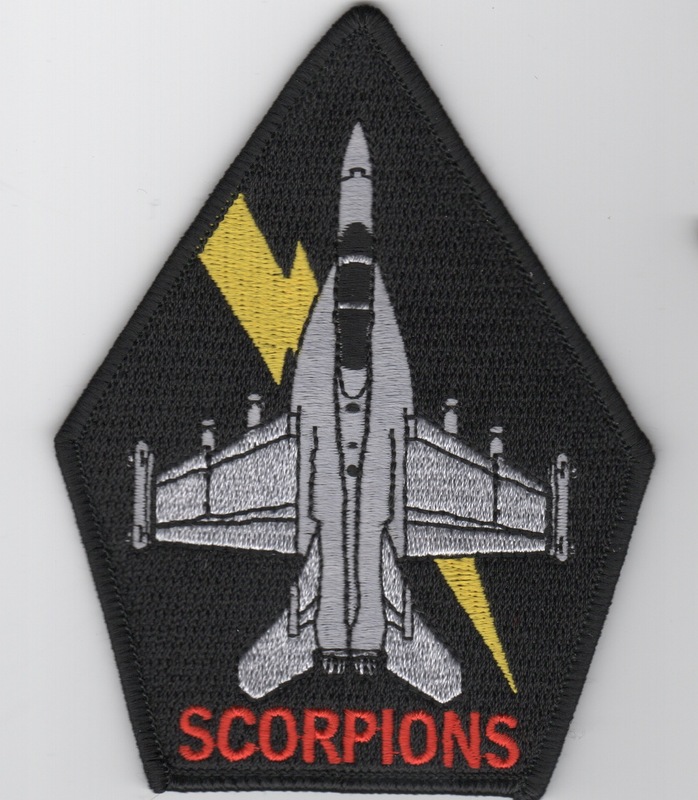 This is the black/red version of the aircraft "bullet" patch for the VAQ-132 'Scorpions' that fly the EA-18 'GROWLER' out of NAS Whidbey Island, WA. It says "SHOCKER" at the top and "THEY'LL NEVER SEE IT COMING" across the bottom. This patch does not have velcro attached. This is the black/white version of the aircraft "bullet" patch for the VAQ-132 'Scorpions' that fly the EA-18 'GROWLER' out of NAS Whidbey Island, WA. It does not have velcro attached. 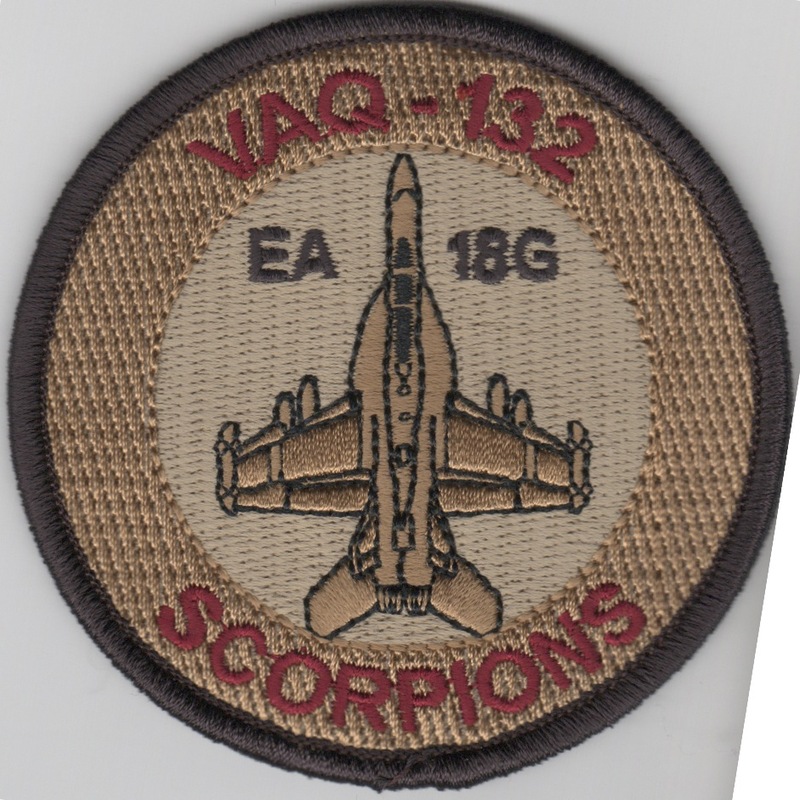 This is the desert version of the aircraft "bullet" patch for the VAQ-132 'Scorpions' that fly the EA-18 'GROWLER' out of NAS Whidbey Island, WA. It does not have velcro attached. 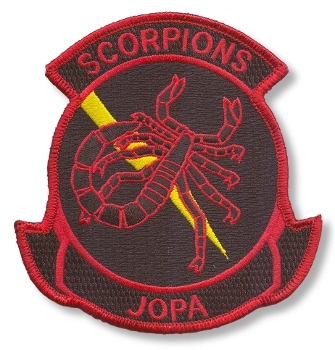 This is the black/red version of the JOPA patch for the VAQ-132 'Scorpions' that fly the EA-18 'GROWLER' out of NAS Whidbey Island, WA. 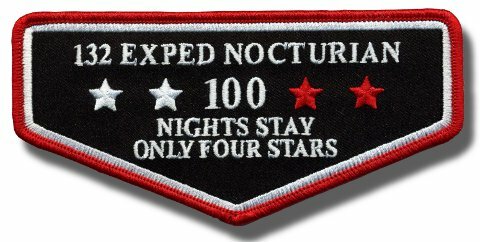 This is the black/red version of the "EXPED NOCTURIAN" patch for the VAQ-132 'Scorpions' that fly the EA-18 'GROWLER' out of NAS Whidbey Island, WA. Signifies 100 night traps on the boat. 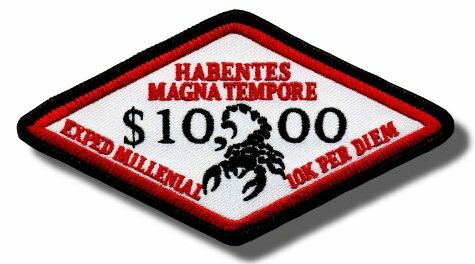 This is the $10,000 "PER DIEM" patch for the VAQ-132 'Scorpions' that fly the EA-18 'GROWLER' out of NAS Whidbey Island, WA. 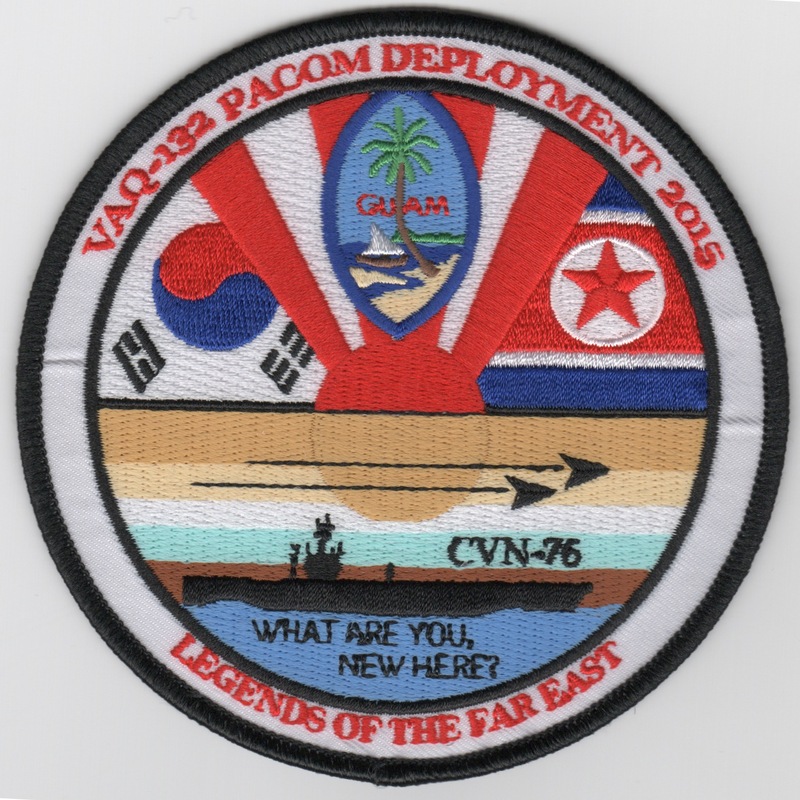 Homepage | Order VAQ-132 Patches!